An authentic hand-crafted Pin Cushion Nantucket Lightship Basket with all of the fine craftsmanship of my traditional Nantucket baskets, with a modern and updated twist! My Pin Cushion Nantucket Basket - perfect for the "fabric artist" (sewing, quilting, crafts) in your life even if that person is you! Finely crafted with a cherry wood base, tapered and beveled cane staves, fine and tight cane weaving and dyed rattan reed rims, which have been nailed and single lashed in cane. 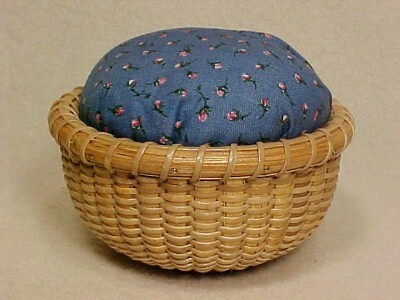 The cotton fabric pin cushion is tightly stuffed with a poly fill and is removable. A beautiful addition to your sewing area or as a lovely addition to your Nantucket basket collection! The Nantucket basket measures a mere 4" diameter and is 2" high at the rims. Signed and dated on the base. Although I am no longer accepting orders for the Pin Cushion Nantucket Basket, I do craft one or two of these per year. When available for sale, you can purchase it directly from my Simply Baskets website.